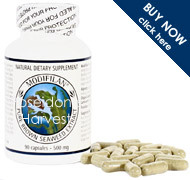 Modifilan is extracted from the brown seaweed known as Laminaria japonica, grown in the pristine Antarctic waters of the Southern Pacific ocean. Harvesting Laminaria is a laborious process that involves much manual labor including hand-harvesting by divers, transportation by boat from source to land, and finally sun-drying, after which, the seaweed undergoes an extraction process. The patented technology of physical extraction and low-temperature, vacuum-evaporation processing removes the seaweed's heavy outer fiber and leaves only the inner, water soluble part of the Laminaria leaf. This involved process enhances the amount of polysaccharides, minerals and vitamins retained in the extract. The removal of the heavy outer fiber also increases the remaining extract's digestibility and bioavailability. After the extract is prepared, it is encapsulated and bottled as Modifilan. Forty pounds of seaweed are used to make a single pound of Modifilan. Modifilan is made in the USA. Modifilan was first researched and developed in the USSR as treatment for science lab and power plant workers affected by radiation poisoning resulting from nuclear fallout. The Soviet government wanted to discover a natural process by which to detoxify the human body from metal and radiation contamination, so a project was launched to find such a method. To find out more about Modifilan please visit the manufacturer's website: www.modifilan.com.